After a successful pilot phase that enabled more than 28.5 million people across Africa to switch from polluting energy sources such as kerosene to clean, sustainable solar lighting, the joint IFC-World Bank Lighting Africa program has expanded to 10 more countries. 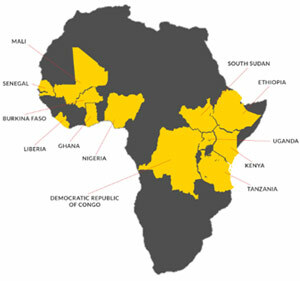 Piloted in Kenya and Ghana, Lighting Africa is now operational in Burkina Faso, the Democratic Republic of Congo, Ethiopia, Liberia, Mali, Nigeria, Senegal, South Sudan, Tanzania and Uganda. The program takes a two pronged approach drawing both on the private sector expertise of the IFC, and the World Bank’s experience of working with governments to support countries’ goals to increase access to energy, vital for socio-economic growth and development. Lighting Africa works with the private sector to build sustainable markets for modern off-grid solar lighting products, as well as with rural electrification agencies to promote incorporation of off-grid energy products in governments’ wider energy access programs. “In the five pilot years of Lighting Africa, we increased access to solar lighting in Kenya from barely 2 percent in 2009 to about 12 percent currently. We are optimistic we can replicate the Kenyan success across Africa and enable about half of the unelectrified population (250 million) access to electricity for the first time through modern solar lighting products by 2030,” says Itotia Njagi, the IFC Lighting Africa Program Manager. Lighting Africa has undertaken market and consumer studies in the additional countries to establish the feasibility of markets for solar lighting products, and is in the process of rolling out a variety of market development activities. In Ethiopia, the program has gone a step further and brokered a government-run foreign exchange facility, which has enabled product importers and distributors to build product stocks in-country. As of October, about US$ 3.6 million from this facility has been disbursed for importing and distributing solar lanterns, solar home systems (SHS) and energy saving bulbs. In Nigeria, the program will soon launch a consumer education campaign to build awareness on the available quality-verified solar lighting products in the country. A more in-depth market research study will also be undertaken to better inform new market entrants and other players along the supply chain of the opportunities and challenges. The success of the joint IFC-World Bank Lighting Africa pilot has also inspired new off-grid lighting market development programs in Bangladesh, India and in Papua New Guinea. Other countries where similar programs are under development include Indonesia and Pakistan. “Lighting Africa has provided an important foundation for the dynamic off-grid solar device industry. It has given us the confidence that the market development approach works in enabling the private sector deliver modern energy services to the energy poor. We are replicating this model not only in Africa, but also in Asia and other regions,” says Russell Sturm, IFC’s Global Head of Energy Access Advisory.